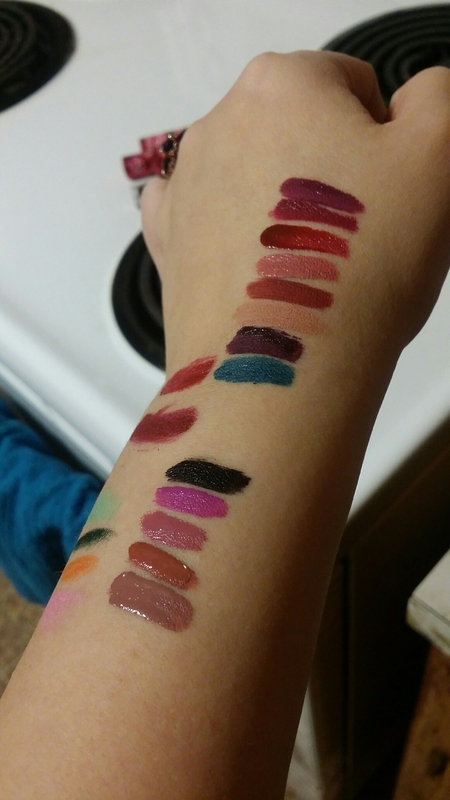 can you tell which ones are the fake Lime Crime Velvetine? I had to wait until I was able to get my hands one some fakes of colours I did already have from a trendy makeup company. My friend helped me as she had some real and fake from the company “Lime Crime”. She got the fake ones from the Wish app. We played a game: try to mix them all up to see just from the packaging alone if I could tell. could you tell by the lids? all these stickers are different! We tried looking at the lids. I had some older real ones, that have a different font and the double unicorn on it. Some of the colouring on the roses on even the real lids were different so that wasn’t a give-a-way for the fake ones. I thought that maybe the stickers would be a dead giveaway. nope the font and style are all different on all of them and unfortunately the print is soo small that I couldn’t read the numbers which might be one. So how can you tell?! Its the actual bottles and brushes. The real is on the left and the fake is on the right. Notice the real bottle isn’t as opaque? The opening for the bottle also is the correct size. We tried with foggy-ier plastic fake tubes and the opening the brush goes into is either too big or too tight. The real one will fit just right. The brushes are different too: the real brush is stubbier and fatter while the fake is a longer, less densely bristled brush. So chemically are they different? On the left are the real Lime Crime Velvetine lipsticks. on the far top left are my Lime Crime regular lipsticks(I wanted to see if maybe the fake composition was closer to this just in case). The right is all the fakes. In the top middle is the colour my friend and I have left is real and right is fake. You can see that pigment in the real one is way stronger. We found the fakes to be more sheer and liquid. All had great staying power and for if you aren’t brand loyal the fakes are a okay replacement. So is it safe? Well first you need to look at blogs like this one where they explain that even the original Lime Crime wasn’t that great for you in the first place and some people who don’t know if they will like it, 20$ is a lot. I personally have no problem with the fakes they last and I’m not that much of a snob about having to do more then one swipe of lipstick. Now this is just my test against 1 brand’s 1 product compared to a fake. There are soo many fakes out there and even just discounted products sometimes you wonder why you can get it at a weird store like Winners, Homesense or even the dollar store. These stores buy old or mis-handled products. You can totally find OPI nail polish at the dollar store.. that’s from a year or more ago! And why can I buy a huge bottle that would normally be 60$ of JOICO shampoo at Winner’s? Because that shipment may have been frozen which damaged the integrity of the product and won’t work up to expected standards.